﻿ Royal Huahine Resort, Huahine Island | FROM $148 - SAVE ON AGODA! 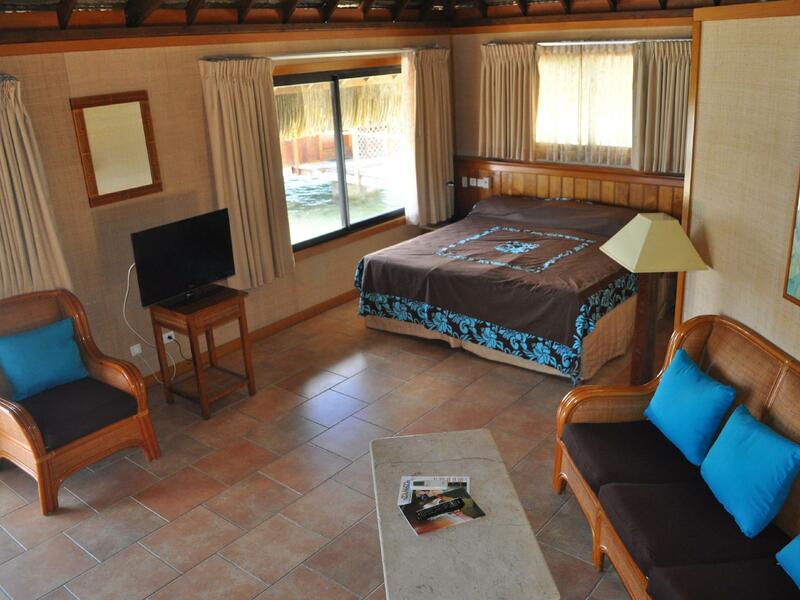 "Was a great stay, overwater bungalow was a huge space & grea..."
Have a question for Royal Huahine Resort? "The bay is nice too with a private beach and a very peaceful atmosphere." "The restaurant is ok breakfast is good!!" "Pool and grounds nicely kept, and clean." Enjoy the natural wonders of the Tahitian Islands from the peace and tranquility of this exceptional resort. The Royal Huahine Resort offers a choice of accommodation, ranging from the well-appointed garden bungalows to the obligatory, over-water chalets that are typical of the Polynesian Islands. All guest suites are superbly appointed, featuring locally produced decor and furnishing with that distinctive island feel to all the rooms. Service is first-class with warm, genuine hospitality that is unique to the South Pacific, and the resort's staff will go out of their way to ensure all guests are cared for and made personally welcome. Activities and excursions from the resort are focused on the surrounding sea, and submerged reefs make this area a mecca for divers and snorkelers. For those who've never tried diving, take an introductory dive with one of the resort's qualified instructors, or for those with more time, sign up for an open water course and become certified in one of the world's top dive destinations. I was there for only one night. The resort is very nice. Great space in the overwater bungalow. Big deck. There's a shower right at the stairs to the ocean which is great. Unfortunately at the time (beginning of February) the water was slightly cloudy. There were no big issues, just some details. Everything was clean, no issues there. But some things would need a little bit more maintenance or repair as they look aged (e.g. the refrigerator remembers better times; footpaths; piers to the overwater bungalows, ...). I enjoyed my short stay there. You get what you pay for - and in the case of the Royal Huahine, you get a lot more than what you pay for. Yes - straight up: the reviews about the state of the bathrooms, the mattresses and the general fit-out of the bungalows are true. Our bathroom was falling apart (in parts), the mattress was well-used and old and the bungalows attracted a lot of (seasonal) humidity during the night, despite running the air-conditioning unit to pump the moisture out. Now... no one comes to this place to expect a 5-star hotel. When you get off the shuttle boat, there is a sign - you cannot miss it, where it says 3-stars. In this category, the hotel is in a league of its own. Snorkel in corals in pristine waters right off the beach, beautifully manicured grounds, well executed gastronomy (albeit one slight mishap - I don't believe sliced red candied cherries should come anywhere near a seafood ravioli). Frequent, free-of-charge shuttle service by boat to and from town and very friendly staff! 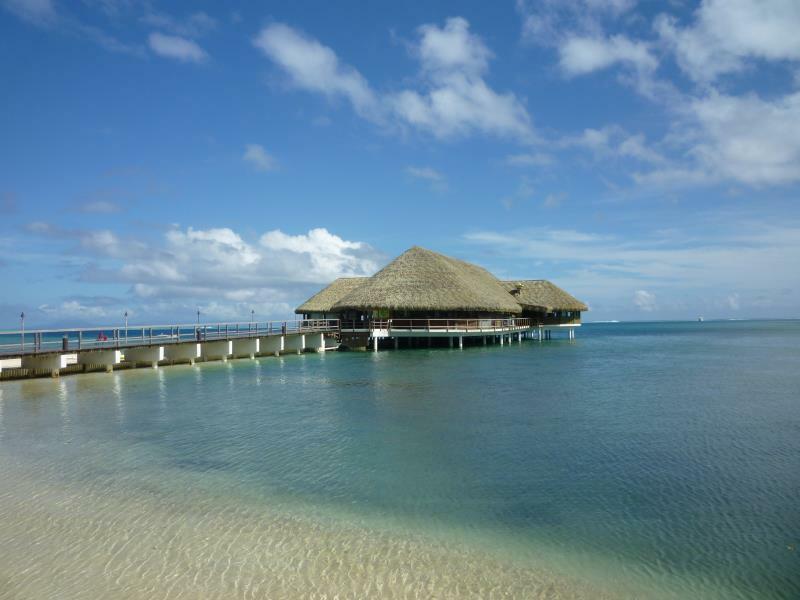 Was a great stay, overwater bungalow was a huge space & great value for your $$. The decor could be updated, especially the bedding & towels. The island is very green, more like a jungle. Loved it. The service was great. You take a boat to get there, so stop at the Super U grocery store for wine, alcohol, cheese crackers yogurt chips etc. There is a mini fridge in room. We kayaked all over. You must eat dinner at hotel because last boat from town is at 5pm, but we were ok with that since we were there for our 25th Wedding annv. We spent 5 nights here which was great. I would recommend the Jet ski tour, and the Land tour. We hope to return because it was such a great experience. Hopefully, by then they will at least update the sheets & towels(You get 2 beach towels & 2 bath towels only, would nice to get 2 hand towels as well). The bacon cheeseburger at lunch is amazing & at dinner the goat cheese salad is great. They offer free snorkeling gear, kayaks, & canoes. we stayed in the over water bungalows and loved the experience. the bay is nice too with a private beach and a very peaceful atmosphere. snorkelling from the room is nice too! !the hotel itself is a bit old and needs maintenance so don't expect 5 star standard but the hotel has character and every member of the staff is nice!! the restaurant is ok breakfast is good!! there is a boat to the town every 2h so you can buy stuff and eat lunch in town... we liked it very much!! Maybe my expectations were higher than they should have been. I paid for an overwater bungalow which is very nice indeed. However, I had 5 minor complaints which I addressed and although the lady at the reception was friendly, little happened. The fridge was dirty and not cleaned, the safe was not working and disappeared after my complaint, the tap water is not drinkable, but there is only 1 liter of water for two people the whole stay included. Also breakfast goes extra on the bill. I left there 1.000 Euros in 5 nights and just had an expectation of receiving more luxury for the money. Maybe this is not reasonable in French Polynesia. The Royal Huahine exceeded our expectations and then some. Highly recommend to anyone looking for a bit of paradise. Got off the plane, car was there. Got to the dock, the boat was there. Boat dropped us at steps to reception area. Checked in with drink in hand. From there it got even better. On departure morning, boat was ready. At the dock, car was waiting and 10 minutes later, back at airport. Overwater bungalow was awesome. great service, great food . great choice, water so clear. We stay overnight at the deck because weather is super. Best in Hauhine!! Excellent staffs and services. Stunning location with good snorkeling right off the beach. Beautiful and spacious bungalows. Paradise. Downside : Only 3 ferries leave the hotel to go to Fare each day. Once you're in town, you need to wait 3h for the next one to take you back to the hotel so forget quickly going into town to run a few errands. You can charter a ferry at other hours, but it will cost you. This I found particularly limiting as we are totally reliant on the ferry. No wifi in the rooms and wifi at reception is mediocre. They tried to charge us XFP1000 to make a phone call to Fare to set up a dive for the next day. I understand telephone fees are exorbitant in this country, but for the price of the room I would have expected them to help us make a 5min local phone call without a fuss. All in all, superb stay. 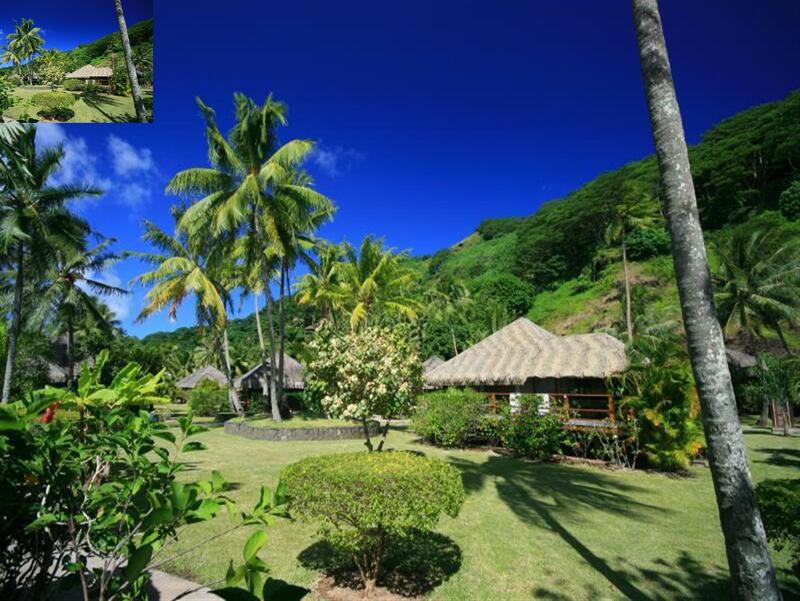 The Royal Huahine is a beautiful hotel with amazing views and scenery. It has an intimate and quiet feel, but also provides water activities to keep busy during the day. We stayed in an overwater bungalow and had an amazing time enjoying the views from our deck. The room was very large and had a hug deck as well. We were hoping to have a bit more privacy on our deck, but it faced two other bungalows. The room itself was a bit outdated and musty, but had everything we wanted and needed. The restaurant is average but pricey. The breakfast was quite expensive for the few options offered. We would skip that if we were to ever come back. The service in the restaurant is very slow, so be sure to give yourself plenty of time to order and eat. We really enjoyed our stay and were sad to have to go. We would gladly come back if we were ever to travel the Polynesian Islands again. Great staff. Restaurants' portions very generous and excellent cuisine ( we had always fish) . Wonderful waking up hearing the sea (we had beach bungalow) . Perfect to relax ; different from any other island, because Huahine is still very wild . Rent a scooter to tour the island ! The location is the best on the island, amazing views, protected by the mountains so not much wind but enough to keep you cool. The only issue is it is only accessible by boat or a very very rough 4x4 track. Have to use hotel transport and it's not available in the evenings if you want to have dinner in fare unless you pay extra. Food was okay, large portions, but limited menu, but we were off season so some things not available. The spa is no longer in use, but treatments are available in your room on request. The beach side bar was closed for the whole time we were there due to low occupancy. Pool and grounds nicely kept, and clean. Staff very helpful. We did the tours, a round the island tour with Poetaina Cruises and a 4x4 trip and jet ski day with Pension Fare Maeva. Both days great fun highly recommended. We loved our stay... Only :if you usually eat three courses go with the halfboard ( 8600 per Person including American Breakfast and Evening 3 course from the menu ) but book in advance or latest on arrival otherwise you have to pay the a la carte prices ,cause you can't book it just before dinner. Lovely, friendly staff (Front Desk Felicity and Staff in Dining Room/Beach Bar treated all guests so well) Stayed in Beach Bungalow #6 which was spacious and clean, and only stepped from the clear, warm water. Pool was immaculate. Lunches overlooking the ocean were delicious. We even loved the cat! So missing the Royal Huahine and the laid-back ambience. Thinking about going back soon....tommorrow?? Excellent escape. Clean and quiet bungalow. Great snorkeling near the resort. Outstanding snorkeling just a short kayak ride out to the reef. Prices were what we expected for Tahiti. Food was delicious. Staff was professional and helpful.